Glencoe Keyboarding with Computer Applications will appeal to every student. All elements, including the courseware, textbook, and student software manuals are fully integrated to provide students with the total learning experience. Glencoe Keyboarding with Computer Applications will appeal to every student. All elements, including the courseware, textbook, and student software manuals are fully integrated to provide students with the total learning experience. 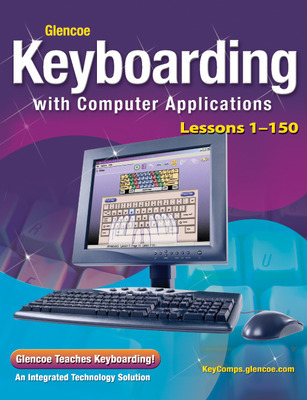 The first section of this program concentrates on learning the keyboard and word processing applications. Later lessons cover desktop publishing, databases, and spreadsheets. The courseware provides students with immediate feedback as it scores timings and most documents. Cross-Curriculum activities enable students to use their keyboarding skills in other courses. The student manuals serve as software reference guides.